Want to be always up-to-date? Sign up for newsletter or use RSS channel! After watching season 3 premiere one thing came into my mind. This is that thing. It's a silly mini-game based on Super Derpy engine. Unfortunately, due to limitations of used library, it works currently only on GNU/Linux. Don't worry, development of this game took only one day, Super Derpy is not forgotten! :) This game also served as technological experiment for future development of Super Derpy: Muffin Attack. Results are quite interesting, but I'll keep them secret for now to not spoil anything. Using GNU/Linux? Grab your sources here! Make sure to also check our Muffin Size Update for insight into the future game content! Yay, I'm flying in a post with muffins in its title! 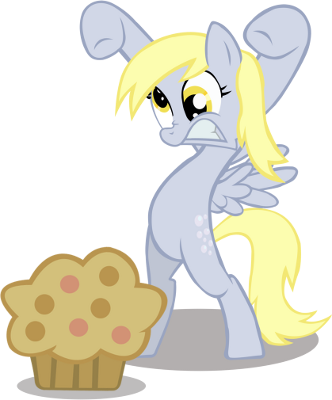 Super Derpy: Muffin Attack is still early in development process, but that doesn't mean you'll have to wait eons to get some information about the game with your favorite mare as main hero! For last two months, after initial Development Preview release, most of the work went into the game engine. The great amount of that work is not visible at all for players (for instance changed build system), but they'll make future development a lot easier. There are also things that are not visible yet, but they will be soon. For instance support for transitions between animations - so no more sudden jump between walking and flying Derpy! Some of the changes are visible right now - like being able to choose between letterbox or scaling mode. You'll be now also able to download an easy installer instead of plain zip file. Lots of small details are being fine tuned, and there's still room for more fixes. Unfortunately, the next release won't have many changes in game content - it will focus on bug fixing and providing rock-solid base for future development. But hey, that doesn't mean that we're not working on that content! So... take a sneak peak! Announcement: Development Preview is out! It's finally there. Super Derpy: Muffin Attack 0.1a - Development Preview is available to download! Don't know what's going on? Read FAQ! It took few months to bring the game to its current state. It wouldn't be possible without help of amazing people. This release contains some work from them and I would like to bring more details about that. Some time ago I got in touch with few voice actors. Most of them still wait for their tasks, but two already got things to do. And they did them, with awesome results. In this release, you can hear MEMJ0123 as Princess Celestia in intro and Meredith Sims (Emichwan88) as Twilight Sparkle's voice reading aloud the letter to Derpy. They both are part of Silly Filly Studios and you probably can recall hearing Celestia's impression by MEMJ0123 in their first production. You may also know Meredith as Twilight's voice in MLP: Fighting is Magic. Character animation is quite important if you want to create visually attractive game. Awesome sprites with Derpy were made by Yudhaikeledai - if you still haven't seen his MLP Thinking with Portals series, then better go watch it now! Besides of animation, graphics take a great attention too. Ania Karlik (known also as Eris) did wonderful job with her animated drawings for intro pages. Map of levels wouldn't be as great as it is without help from Agata Kurczewska, who drew missing parts, and Wiktor Grześkowiak, who vectorized Agata's work. Claire Anne Carr will be responsible for music in Super Derpy: Muffin Attack. Yes, the same Claire Anne Carr, who did amazing My Little PonY Rock! albums! For now, you can hear in the game songs from his instrumental album Sounds of a Pony Soul. Worth noting is also track used in main menu - it's an excerpt from Don Discord theme by Dr Dissonance.